Ok, so homeschooling in Yemen may require a bit more creativity than say in the states, but its do-able. I have found that the longer I have been here, I have found more and more supplies and helpful things for homeschooling……………….. I picked up this cute little set from City Mart. It was around 14 bucks, but as we haven’t really done too much in the way of science, I wanted to get the kids something to be excited about. (I’m a cheapy). And it really works………. 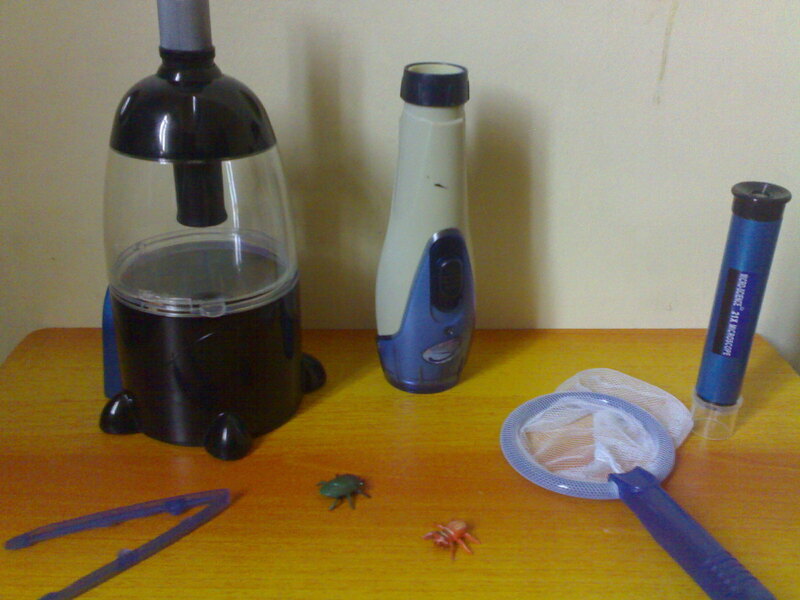 its a bug kit, but I bought it for the microscopes……………..
At Happy Land, I noticed a chemical set, I guess solutions for reactions and what not. It had a lot of vials. I was too cheapy to get it, can’t remember the price, but I may invest in it. A younger brother (Yemeni) told my son that they got dirt from a nearby park. But you have to be careful here as sometimes the locals don’t “get” the things that we do and can be really particular and un understanding, so I’m not sure if we’ll venture on to this. But I have seen some nurseries on Sharia 45 (the street Pizza Hut and KFC are on, but down in the other direction more towards Taiz. You could probably pick up some plants there. You can find different printer manufacturers here, but the one I see the most is HP. A fax/color printer/scanner, Office Jet runs for around (100-120 USD, can’t remember the exact price). You’ll probably want to visit Sharia Moqadishu (aka Sharia Computer aka Sharia Sakhr) for your computer needs as its Computer Street. I’ve had good experience with Basha Computer and Al Falak. You can get HP refills at both of these places….. Speaking of refills, if you are homeschooling, and you don’t have a PO box to get books, etc shipped to you, you might rely heavily on the net like I do….so you might be printing out a lot of stuff…. I’ve recently entered the world of refilling cartridges. At first, I used to get them filled at our favorite CD store, Scream Center, on the Diary. But they seemed to have stopped doing it or were out of ink or something or another, so we purchased a refill kit at Al Falak on Sharia Computer. 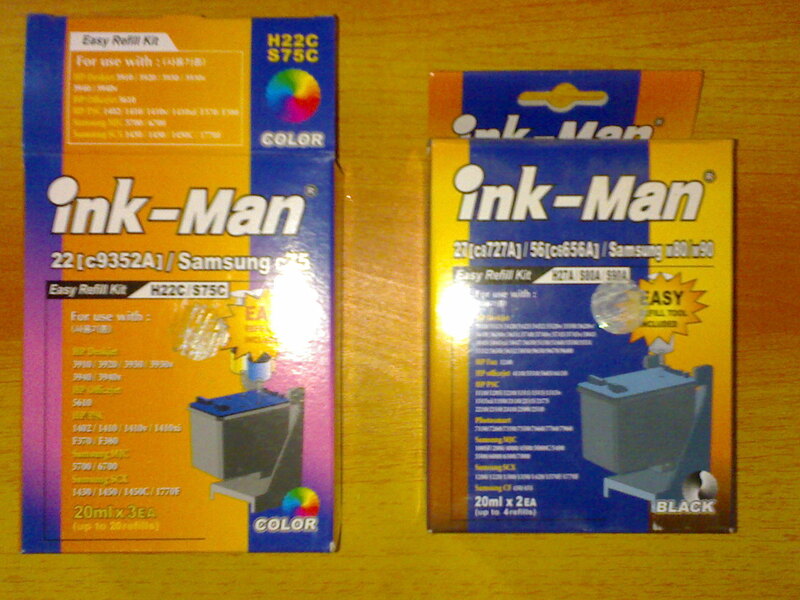 The kits, black or color, run for about 1200 riyals (6 bucks) and I have gotten about 4 refills per kit. Great because one new cartridge will run you about 3500. So its a tremendous savings. Its pretty easy to refill though at first I thought it was going to be difficult. Ok, well they moved the books at Jeel Al Jadeed (that I mentioned in a previous post) , so if you are looking for them, they could be in the “basement.” I doubt that they are completely gone, Allahu ilm. But in their place on the first floor (or ground floor) were dozens and dozens of educational wall posters (with images, but of course you can remedy that, insha Allah). They are a really thin plastic, but at 50 riyals (25 CENTS!!!!) you can’t pass that up if you are homeschooling. They have Arabic alphabet charts, but the bulk of the stuff is in English, alphabet, hundred charts, vocabulary charts, addition, multiplication charts, I mean lots….. You could probably cover a small room wall to wall with them as many as they had, ok maybe not that much, but you get the picture…..
(we’re talking the location on the diary close to jamiah qadeem (old Sana’a University). So if you are coming to Yemen and worrying about homeschooling, do bring textbooks and such but don’t panic too much, insha Allah, you can find lots of supplies at places like Jeel Al Jadeed and there are other bookstores here. It will take creativity, but I think between what is here and of course the INTERNET, and of course, by Allah, homeschooling is do-able here. Homeschooling in Yemen and need books? Alhamdulillah, when we left the states 7 years ago, we brought some school books. I highly advise bringing some if you will be homeschooling and don’t t hink that you will be able to order any online. I have found some books here from time to time, but most of the English books are for second language learners and a lot of them are dull. But, at recent visits to Al Jeel Al Jadeed, the big office supply/school supply store, I came across quite a find. No, no American books, but we found a wide selection of books from a publisher in India (www.navneet.com). The location near Jamiah Qadeem (old Sana’a University) has a new section on the first floor (what we yanks call the first floor, but would be the ground floor others). Anyway, my son had to almost literally pull me away because they had so many books. They have science, math, language arts, preschool books, board books. If you are used to American books, ok, they are not quite the same, but I was happy just the same to find them. I definitely recommend stopping by to take a look if you are really hurting for finding English materials. You can also find some neat books at the other location (near Jamiah Jadeed). I found some neat puzzle books for my preschooler where the pages are puzzle pieces. The English selection at this location is not as big as the other one, but still some of the same stuff. Also, there are two great English book shops in the Tahreer Area. I am not sure of the name of the street (it starts with a jeem I think) and its like one or two blocks from the big post office (going away from the Maydaan). I think one is called Yemen bookshop and another with Hadith I think in its name. The former you can find some great dictionaries and thesauruses (or is it thesauri?) and actually lots of academic books (science, math), but again for second language learners, but hey, better than nothing. At the second shop, I found a great US dictionary and some great Arabic conjugation and grammar charts books from librarie du liban (sp?). Most of the English reading books (novels, etc) will be short versions of classics or in some cases, the actual versions. Filed under: Books/Textbooks | Tagged: Homeschooling in Yemen |	Comments Off on Homeschooling in Yemen and need books? I was at www.collegeboard.com the other day (the people who make the SAT test) and saw that they have a representative in Yemen (to my surprise). Here is the number for the Yemen representative in case you have questions about taking the SAT. Payment: in local currency at the current exchange rate. Also, on another group, someone mentioned that people might be able to take the GED at the embassy here. You can use the link to the US Embassy in Sana’a for the embassy email if you would like to contact them to ask about the GED. If you do, and you get information, I would love for you to share it with me so I can post it here, insha Allah.